Kat wrote yesterday about reflecting as the topic of the week of the Women’s March 10 Actions 100 Days campaign. And the timing couldn’t have been better for me because I’ve been reflecting quite a bit lately on what it means to me to be a feminist. 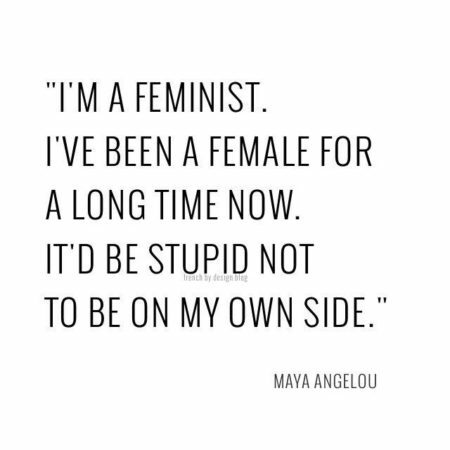 That quote from Dr. Angelou is timely and accurate for me as I have been a feminist for a long time now. I grew up as the daughter of a strong woman who was a single mom for several years. I attended a woman’s college. I work in a female dominated profession. I am continuously and constantly on the side of women. To me that means to make choices that are right for me, to respect the choices that other women make that are right for them, and to not judge any woman for that choice, whether I agree with it or not. Dale told me that on the day of the Women’s March he read a comment on Facebook that was made by a woman friend of his who said, basically, “I am not attending the march. I am home today making breakfast for my man because that is my place.” And to that I say, well, good for her. It’s not what I believe in but if that’s what she truly believes and truly chooses then I won’t judge her for it. Dale said that she then went on to say, “and that’s where all women need to be today. Home, taking care of their husbands and families.” That right there is where it goes too far for me. If she’s happy at home then more power to her. But for her to say that all women need to be happy at home is just judgmental and divisive. This extends to so many choices that women make. Working. Not working. Having children. Not having children. Breastfeeding. Not breastfeeding. Running a household. Managing a career. Getting an education. Dividing household responsibilities. And on and on and on. I truly believe that we need to accept the choices of all women (again, so long as those choices are freely made) whether their choices reflect our own values and beliefs or not. I chose to get an education, to work outside the home and have a career, to get married and have a child, to breastfeed and return to work, to provide for my family and so much more. I expect to be respected for my choices just as I will respect a woman who chooses differently. But so many times I see women disrespect other women’s choices. I see women judge each other and tear each other up and discredit any choice that is different from their own. I know that feminism goes much further than this and I long for equal pay and equal rights for all women. But I believe we need to stand together as one before the rest of it can truly happen. I believe we need to support other women as the first step of resisting the politicians and policies that work against us. Are you with me? I welcome and encourage your comments and discussion today. Yes, yes and yes. Truly, I will never understand the impulse to tell other people how they should live. I have my hands full deciding how I should live. Who has time to run others’ lives?? Pretty much my thinking on the matter. As I was reading your well written piece, it crossed my mind that men almost never even have to think about this stuff for themselves. Unless a man doe something fairly extreme like quit his job to become a professional surfer, no one really comments on his decisions except those directly effected. A woman can be queried by strangers on the street if they think she’s too old/young/fat/blonde to be pregnant or an astronaut. Amen! And very well written. Thank you. Well said, Carole, & thank you! I always struggle with saying “No” to something or making choices that are different from my friends; I always feel that I have to have a valid excuse. My much younger sister has been reminding me that women have been conditioned to respond in this way and that I don’t need an excuse for my decisions. I’m working on being more assertive and finding it freeing. Yes, we need to support each other! I am so glad you said this! I don’t think that just because someone is a woman we should support anything and everything they do, any more than we do in the case of men. And if I was the dictator of the world, it would be a different kind of place. But I’m not, and it isn’t. Whenever I get ready to think someone’s decision or viewpoint is wrong, I try to ask myself – since mine is usually the opposite – does that person have any right to tell me what to do about my decisions and viewpoints? If the answer is no, then I need to respect theirs. I love reading your words of wisdom about feminism! I support women and their diverse choices, and I especially believe that they should have the ability to make choices that are equal to those of men. I have a friend that is afraid to call herself a feminist because she thinks that being pro-woman means that you hate men, but I disagree with that. We had an interesting discussion about Hillary Clinton where she told me that she couldn’t support her, even though she is a woman. I supported Hillary because I thought she was the best-qualified candidate, not because of her gender. Women have proven time and time again how capable we are, at all kinds of things, and we need to support and help each other. Well thought out and well said. I couldn’t agree with you more. Have a great day. I am so with you. This was an eloquent post–bravo, Carole. I think your comments could apply to any situation where we have differences, as long as they are not intended to harm others or for that matter ourselves. Nicely said, Carole. You are very eloquent, with a strong, wise and supportive voice. More women with a voice like yours, a strong personality and presence are needed to represent us all! AMEN!! I have so longed to say to so many people (men and women included) don’t expect me to be/do/think/talk exactly like you – but lets embrace each other and be supportive of where we are in our journey. Well said, my friend. I have read allot of the things Elizabeth Cady Stanton & Susan B. Anthony wrote, and I don’t understand why we are still have this discussion over 100 years later. I agree that we should respect the choices other people make, but I also think we should respect that not everyone gets the things they choose; I am single and don’t have any children. This isn’t really the life I would have chosen for myself, but it’s the way things have worked out for me. Every time I pay my property taxes, I say a little prayer thanking the universe for Cady & Stanton—I was able to get an education, and a good job, and own my own home. I can’t find it, but somewhere, there is a quote where Cady & Stanton compare a woman’s life to someone rowing a little lifeboat across the ocean. I’m allot more comfortable in my little boat because of the basic HUMAN rights they earned for me. Anyway, I think that woman who chose to stay home and make breakfast for her family should remember that we don’t all have families or husbands who are able to make that financially possible for us. I couldn’t have said it better, Carole. I admit that I have not read the entire book, but How to Be a Woman by Caitlin Moran has so many quotes I agree with, one of which is feminism is not about making us all one particular woman. Exactly what you said, but you said it better. 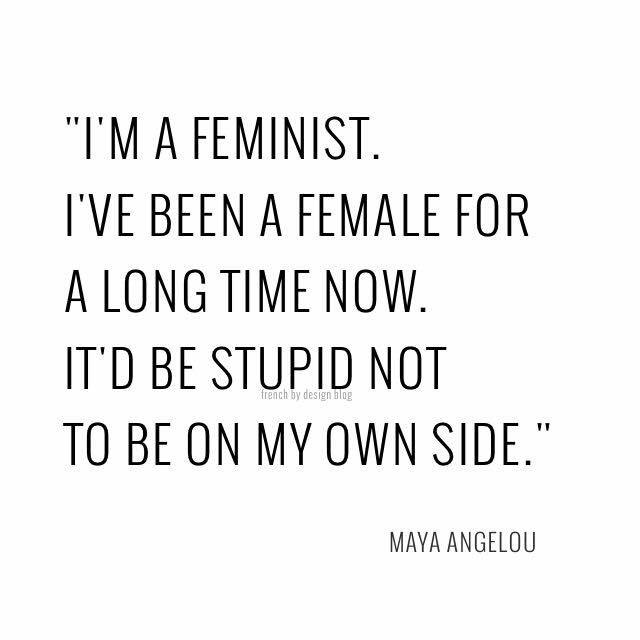 I also like the quote of hers that goes like this, ” When I talk to girls, they say I am not a feminist. I say, what you don’t want to vote? Do you want to be owned by your husband? Do you want your pay from your job to go into his bank account? If you were raped, do you still want it to be a crime? Then congratulations, you are a feminist.” I think feminism has suffered so much from ignorance and misunderstanding. I am so optimistic now that I finally see young women owning feminism. Then I see who got elected, and I am not so optimistic, but hopeful that things will continue to go in the right direction in the future. I have read several articles lately from sociologists that state that women are becoming more powerful all the time. I hope so, I so hope so. Love this post! I grew up in a family where feminism was a “bad” thing. It was a concept that gave men an excuse to behave badly towards women. Now that I’m older and staring down middle age, I am trying to find my voice. I realize I don’t think feminism is a bad thing…it’s a necessary thing. I love this discourse as it helps me be a bit braver discussing this topic with the loud (read: oppressive) female voices in my family who love our new president. You are right…women do tear other women down for their choices in life. Sometimes I think feminism struggles along due to women and not men who run the world. And I agree with the comment above that men never have to justify the choices they make in life…to work, not work, etc. You wrote a beautiful piece. And said everything right in those three sentences.Until we each respect other women’s choices, nothing will come of feminism. Problem is we’ve been told so long by men, and sometimes each other, what we should be. It is taking a while for us to figure out what we need to be and not all of us are in the same place. Thank you for the post. Well said- although we are all Homo sapiens we are not all homogeneous. I’m just glad I live in a country where I can have a voice. There are many women in the world who do not and won’t ever.